CLICK on the photos to see them full size. 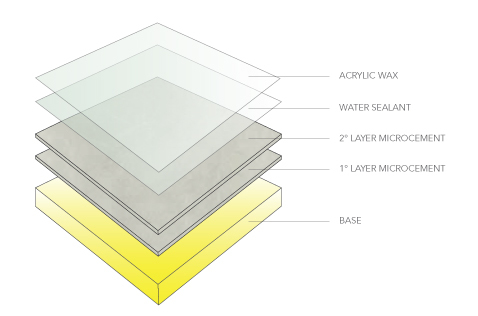 MicroCement is a cement and quartz based lining with thin color (1 to 2 mm). It has a soft, smooth finish, making it ideal for modern and minimalist spaces. It is applicable on all types of hard surfaces. It can be applied on floors, walls, stairs, furniture and other, both indoors and outdoors. You don’t need joints or gaskets, therefore, one can achieve continuous surfaces and it is combinable with other materials such as wood, ceramic, etc. Renovate your home or workspace without much work! One of the greatest advantages of MicroCement is that can be applied over existing linings such as ceramics, mosaics, marble and tiles. It allows you to, in no time at all, renovate space without suffering from disorder, dirt, or the cost of traditional construction work. A modern alternative, tasteful, with rapid implementation and easy maintenance: damp cloth and wax. 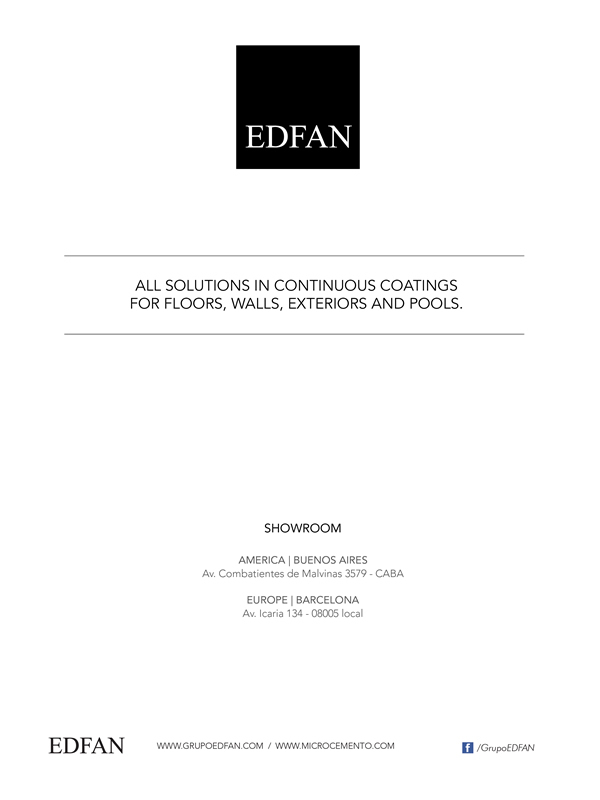 EDFAN realizes your complete project including installation working with top quality materials and highly personnel trained by professionals. QUOTE TOUR PROJECT NOW ONLINE! We also budget our materials independently, so that you are also able to run your project installation with your trusted personnel. QUOTE YOUR MATERIALES NOW ONLINE! – Can be applied over other linings such as ceramic, porcelain, marble, mosaics, tiles, concrete, mortar, and plaster. – Replaces smooth concrete floors because of its slight thickness and better finish. – It is easy to clean. – It is suitable for high traffic locations. – It is highly resistant to UV Rays. – 2.8 to 3.2 parts powder for 1 part liquid (by volume). – Store in a dry, cool place in original closed container. – 6 months in closed container. The selection of colors of this letter is for reference use only and are as similar as possible to the real colors. Because we work with only natural materials such as cement, sand and water, these may undergo changes in color and tone. We are a dynamic international company that develops, manufactures, installs and markets continuous floor lining for floors and walls, both indoor and outdoor as well as for swimming pools. For 15 years we’ve positioned ourselves as leaders in the construction and decorations market, setting trends as far as concrete/cement floors. We excel by developing and producing high quality products that standout when it comes to aesthetics, are easy to maintain and are highly resistant. Take a tour of our site and be amazed! ¡Thanks for having us Madrid!